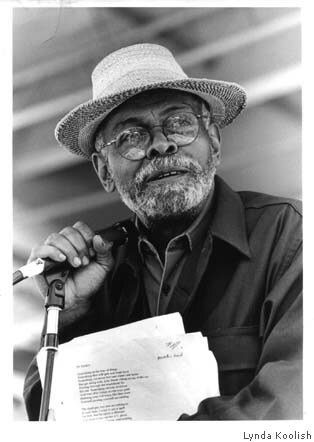 From Tru Ruts Freestyle Theater, a chance to see the great poet/playwright/activist Amiri Baraka live and in the company of many fine Twin Cities artists including Kevin Washington, Anthony Cox, and J. Otis Powell. Tickets are available online. Easy-breezy; order, pay, print them out. E.G. Bailey adapts Amiri Baraka's Wise Why's Y's, an epic journey through the history of Africans in America, and a perfect blend of avant-garde poetry with the griot consciousness. Paying homage to Langston's Ask Your Mama, William Carlos William's Patterson, and Melvin B. Tolson's Liberia alike, it attempts to articulate the history of a people or a place. Wise Why's Y's questions and answers broad themes of history and cultural identity. Tru Ruts' Freestyle Theatre presents this evening of provocative Spoken Word, Jazz and Dance. The event will be held on Saturday, October 15th at the Southern Theater, 1420 Washington Ave S, Minneapolis, MN 55415. 8:00pm. Tickets are $7 in advance. More information at www.truruts.com. Internationally renowned poet, playwright, musician, jazz critic and novelist, Amiri Baraka, along with a collective of dancers, musicians, and spoken-word artists, perform at the Southern Theater in this fresh adaptation by Bailey of his book Wise Why's Y's, a provocative yet honest conversation about race, class and identity. Baraka is widely recognized as one of the most important artists of the 20th century, contributing to not only poetry, music, theatre and fiction but also as a tireless activist for change. Bailey collaborates with choreographer Aneka McMullen. The dance ensemble also includes Leah Nelson and Julie Warder. The musicians include Kevin Washington, who leads an ensemble of Chris Cox (Trombone), Anthony Cox (bass), and Truthmaze (percussion). Set design contributions provided by dynamic Twin Cities visual artist, Ta-Coumba Aiken. Also performing with Baraka will be J. Otis Powell, a stalwart of the spoken word community.